The Mumbles Press reviewed the Swansea Little Theatre’s performance of The Way of the World. Dylan Thomas played the character of Witwould but his performance does not receive a special mention within the review. The Mumbles Press was published every Thursday, and sold for one penny. It provided local news, natural history, religious notes and romantic serials. The boys who sold the paper were paid 1d per dozen sold. The following is a piece by Sylvia Bagley about the newspaper, a fixture of Mumbles and Swansea life for many years until the mid 1930s. Her father was its founder C.E. Tucker. “The present City Council should think about that – while the Community Council does now try to address my father’s concerns about local interests, local colour and community identity. Dylan and the whiskered beast of Pwlldu. At about this time in early January 1934 it is believed that Dylan wrote the following piece detailing a close encounter with a furry ‘beast’ at the beautiful cove of Pwlldu, Gower. 2017 to be a legendary year for visitors to Wales. 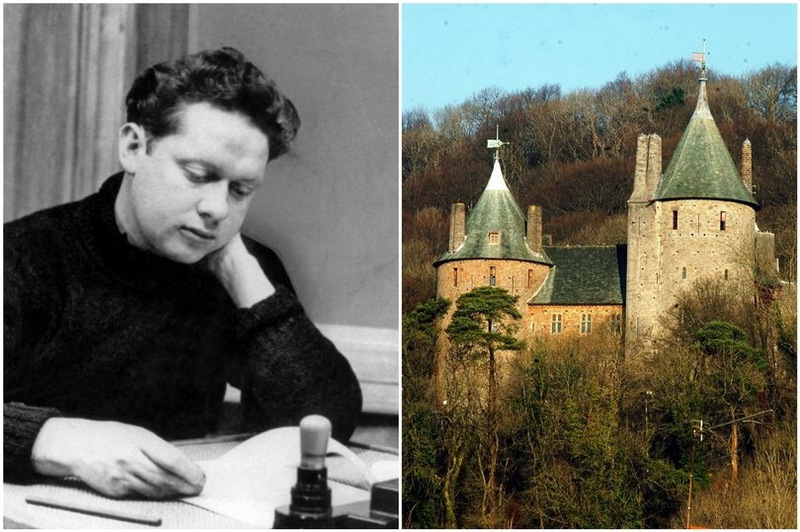 Dylan Thomas will feature as part of Welsh Government’s new marketing campaign as 2017 becomes Wales’ Year of Legends. The campaign aims to promote Wales’ culture and heritage, and follows on from the 2016 Year of Adventure. Just three years after the worldwide celebrations witnessed during Dylan Thomas’ Centenary and a year after the highly successful events surrounding writer Roald Dahl comes another chance to highlight the importance that Wales, its people, landscape and folklore has played in influencing some of its finest exports and how it can still inspire today. Visitors to the home of Swansea’s most famous son also have the opportunity to dine and stay overnight, creating their own unique memories and perhaps to find their own inspiration in the footsteps of the legendary Welsh figure. Take a look at www.dylanthomasbirthplace.com for more details. This Christmas why not treat the ones that you love to a voucher entitling them to an overnight stay, dinner party, lunch or afternoon tea at the home of one of the 20th century’s most famous literary figures, Wales’ most renowned writer – Dylan Thomas. Dylan Thomas Birthplace & Family Home is available for visiting, self-catering and dining experiences throughout the year. A truly unique literary house where you and your friends and family can create your own wonderful personal memories. Whether No.5 is the voucher recipient’s homely Edwardian hub to relax, dine on the best food that the local area has to offer and unwind in, immerse themselves in the World of their favourite writer, or used as a base to explore the rugged and beautiful Gower coastline. It is one magical experience that they will never forget! Don’t worry about postal strikes affecting delivery times – we’ll also send an electronic version so there is no risk of disappointment on Christmas day! Dinner at Dylan’s – A unique experience! Just one of the unique things that visitors can do at Dylan Thomas’ Birthplace is sample the very best food that the local area has to offer. Our dinner parties are designed to deliver that exquisite flavour found in our little corner of Wales. With a piano, phonogram and games table our dinner party guests can relive a typical Edwardian evening before the advent of television. Our sociable evening dinner parties can consist from just 4 people to up to 10 people with the evening starting at 6:30pm with pre-dinner drinks and a tour of the house. Food is usually being served around 7:30pm amidst the splendour of the front parlour. For those who truly want to get into the spirit of the era why not dress up in your best vintage wears? Our menu changes with the season, we’ll reflect what is available from our local sellers at the time. We love to ‘buy local’ and support the traders at Swansea Market (where Dylan’s mother would do her shopping.) We are proud members of the Swansea Bay Food Circle. Don’t worry if you consider yourself a ‘fussy’ eater or have particular dietary requirements, our cooks are vastly experienced and will work closely with the information provided by you to deliver a meal that everyone will enjoy. Perhaps you’d like a starter of some of Swansea’s ‘fruits of the sea?’ – Laverbread (a type of seaweed – don’t worry it is delicious!) and cockles (a sumptuous little shellfish) both residents found in the waters along Dylan’s ‘splendid curving shore.’ or a creamy goat’s cheese from Carmarthenshire (where Dylan had many relatives and spent much time in the summer on the farm of Fern Hill.) Followed by a main course of Gower’s award winning, celebrated salt marsh lamb or beautiful pork with luscious greens followed by a dessert of local recipe cakes, tarts and a delicious platter of Welsh cheeses? – Makes the mouth water doesn’t it! We stayed overnight after a wonderfully prepared birthday dinner for my wife, Georgina the children, Magi (11) & Maisy (6) thoroughly enjoyed the magical experience of 5 Cwmdonkin Drive. The staff were out of this world and could not do enough for us. We had such a great time……we are still all talking about it and saying that it was one of our best evenings out in a very long time. We will be back! Four of us went to the dinner experience in 5 Cwmdonkin Drive and it was certainly a night to remember. Our host was extremely knowledgeable on all aspects of Dylan. We were given sherry on arrival and then had a comprehensive tour of the house. That was followed by a four course meal using all local Welsh ingredients. The meal was first class. The whole experience was memorable! For prices and more information on creating your memorable meal at Dylan Thomas Birthplace & Family Home please call (01792) 472 555 or email info@dylanthomasbirthplace.com – We are also able to provide vouchers – Ideal for a Christmas present!